Aldrick Rosas does not want this to begin quietly. 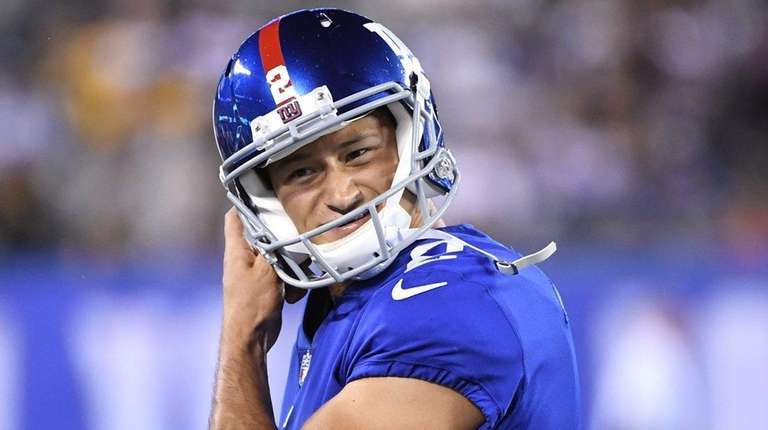 After becoming the first kicker without NFL experience to make the Giants’ roster in 15 years, Rosas will go into AT&T Stadium for Sunday night’s season opener against the Cowboys, and he is hoping the outcome comes down to a field-goal attempt. “I (like) any time I get in the spotlight, or any time I get a chance to put points up on the board,” the 22-year-old told Newsday. And if that means kicking the deciding field goal in the final moments in front of a raucous crowd of 100,000 in a nationally televised game? “I wish all 16 games were game-winning kicks,” Rosas said. Clearly, this is a young man who doesn’t lack confidence. Barely a week after locking up a roster spot with a perfect preseason — 8-for-8 on field goals, 6-for-6 on extra points — Rosas is ready to go. He no longer has to concern himself with making the team after beating out Mike Nugent, which has narrowed his focus. Rosas tried out for the Titans last year before losing out to former Chief Ryan Succop. He’s the first kicker to make the Giants’ roster without the benefit of playing in a regular-season game since Matt Bryant in 2002. Bryant kicked for two seasons before being released in Tom Coughlin’s first training camp in 2004. Rosas would be fortunate if he lasts as long as Bryant. At 42, Bryant is the Falcons’ kicker and preparing for his 16th NFL season. First things first, though. Despite an impressive preseason, Rosas needs to prove he’s a reliable NFL kicker in a big spot. He believes he will do just that, as he did on his final kick of the preseason, a moment that cemented his win over Nugent. Rosas nailed a 48-yarder as time expired to give the Giants a 40-38 win over the Patriots at Gillette Stadium. A meaningless final score, perhaps, but a significant moment for Rosas. After all, it came in front of the kicker he has modeled himself after. “Stephen Gostkowski was my role model growing up,” Rosas said, referring to the Patriots’ kicker. The fact that Rosas’ game-winner came after Gostkowski had made the go-ahead field goal made the experience even more meaningful. Rosas, who grew up in the small north-central California town of Orland, didn’t start kicking until his sophomore year in high school. He was a central midfielder in soccer before giving football a try. And now the dream has come true: Rosas has made it to the NFL and is ready for his debut on the biggest stage of all. Bob Glauber has covered the NFL since 1985 and has been Newsday's NFL columnist since 1992. Twice selected as the New York State Sportswriter of the Year by the National Sports Media Association, he is president of the Pro Football Writers of America and author of "Guts and Genius."